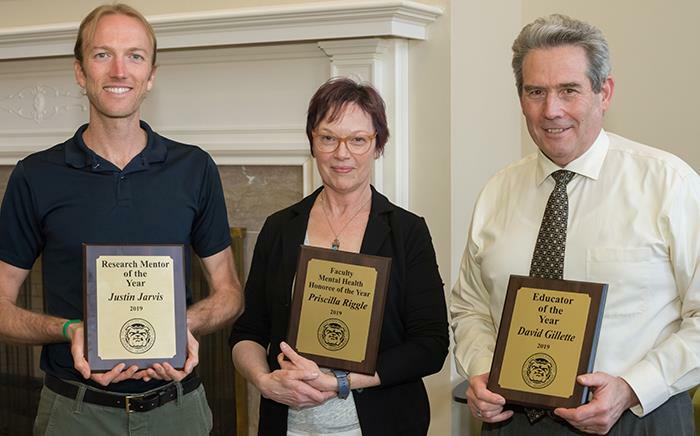 David Gillette, professor of economics, was awarded Educator of the Year at the Academic Accolades Banquet. Gillette was chosen for the tangible ways he empowers his students and the outstanding nominations he received. His passions were evident in the observation of his classroom, where each student enthusiastically participated in discussion, and how he utilizes several different forms of media to engage his students including clips from podcasts and extensive graphs which he designed by hand. Gillette's multiple teaching methods including his daily "MIT," which in his essay was described as a short written statement about the most important thing they learned in class that day, also impressed the selections committee. The finalists for the 2019 Educator of the year were: Torbjörn Wandel, Jesse Krebs, Rafael Tubongbanua, Liulin Zhang, John O’Brien, Christopher Outzen, Sarah Berke, Sarah Mohler, Bev Peters, Michael Rudy and Daniela Ostrowski. After careful consideration, the selections committee chose Priscilla Riggle as the winner for the Faculty Mental Health Honoree of the Year award for her constant efforts to learn more about mental health and extend what she learns to her students and for setting an example for students, co-workers and the Truman community. Riggle dedicates class time to discussion of these pertinent issues and demonstrates that one can be an effective instructor without jeopardizing student’s well-being. The finalists for the Faculty Mental Health Honoree of the Year award include: Brent Buckner, James Cianciola, Eric Dickson and Nancy Daley-Moore. The committee selected Justin Jarvis as the winner for the Research Mentor of the Year award for his video submission which explained how his teaching philosophy rests on two pillars: “love the content, love the student” and “student engagement leads to student achievement.” The selections committee was impressed by Jarvis’ multiple examples of student research which focused on the Kirksville community and his humility and selfless perspective on education. The 2019 finalists for Research Mentor of the Year include: Cassidy Dobson, Julianna Edgar and Michael Rudy.